Dinner time could be the highlight of our night because we are eager to see each other after a tiring day. 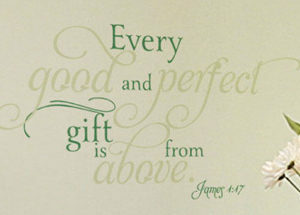 We long to hear the voices of the best people on earth and exchange our inner thoughts with them. Nevertheless, there would be times that we run out of things to say. Unless, you want to sound like a recorded track playing the same notes countlessly! These times happen especially when the dining room is empty, and then you scan your eyes around? searching for a subject that could be turned into a conversation; you wish there was something that could save you from the awkward silence and dull moment. Conserve the effort of a search! WiseDecor can help save the awkward and dull moment in a blink of an eye! As one scripture leads to another, so with one conversation leads to numerous topics you can share insights on. 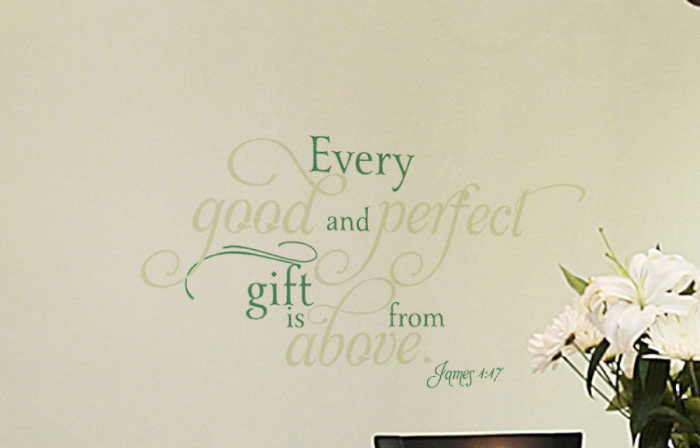 We offer you our original designs of scriptures metamorphosed into decals which you can stick to your walls. 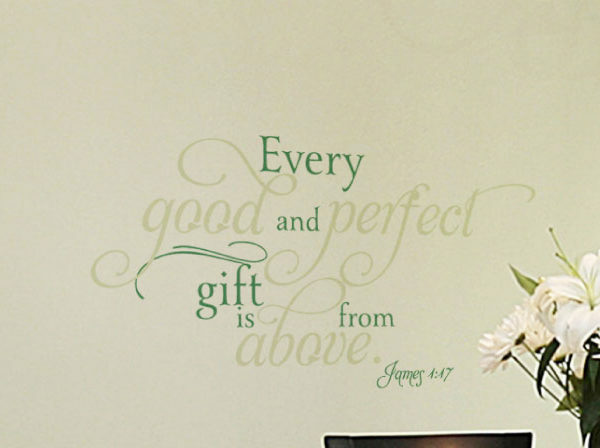 Such as this scripture wall decal that we have right here, “Every good and perfect gift is from above.” You could intend that to be; in this dining table, with your whole family around, that you’ve got every good and perfect gift from God. And that, our friend, is one sweet strategy to let your children know that you treasure them. And then, there goes the exchange of insights. You’ll never know when your story reservoir runs dry. It’s better to be ready during those times and we are more than honoured to be of your service.